During our last AROSC time trial at Willow Springs my GTV's 1750 engine gave up the ghost, a failing crank bearing. Here it is after limping in from the track. 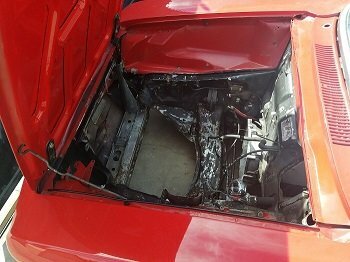 While a new engine was being prepare I thought I'd cleanup and repaint the engine bay a light flat gray. 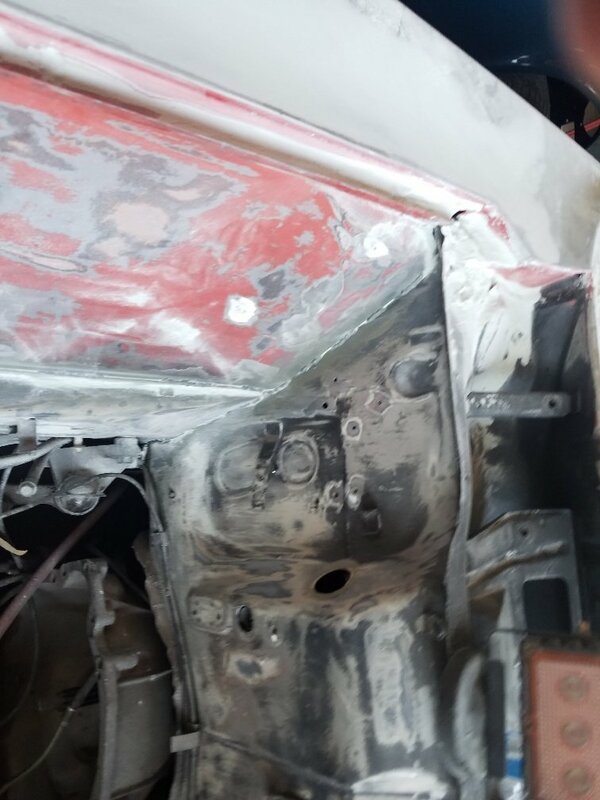 The compartment was a different red than the rest of the car along with some black. 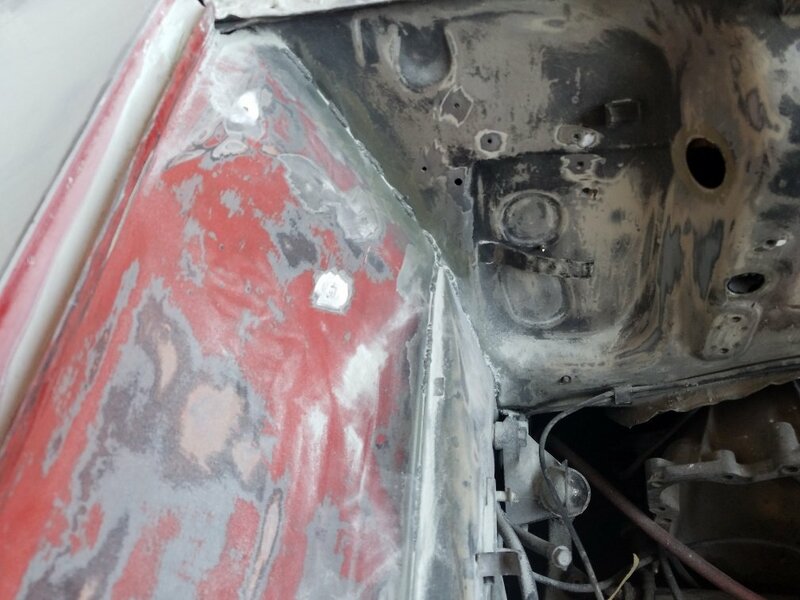 After looking at the engine bay as well as the generally poor condition of it's Porsche Guard Red respray I decide to repaint the whole car. This would be better than it was but not a rotisserie job, the car is still going to be a daily driver/track day car. 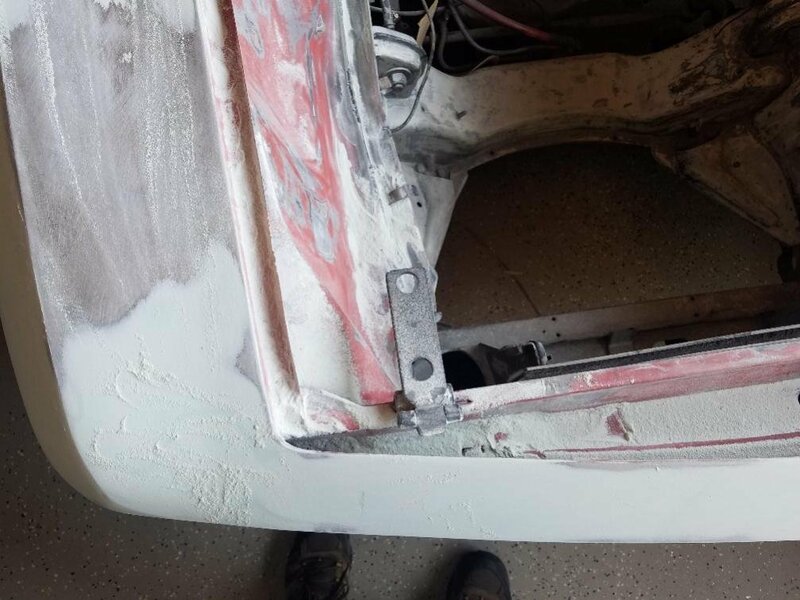 As the paint(s) came off we found tons of Bondo and even a fiberglass "repair" of the right-front rocker. The chassis is experiencing the equivalent of a Nutrisystem diet. I thought I'd cleanup and repaint the engine bay a light flat gray. 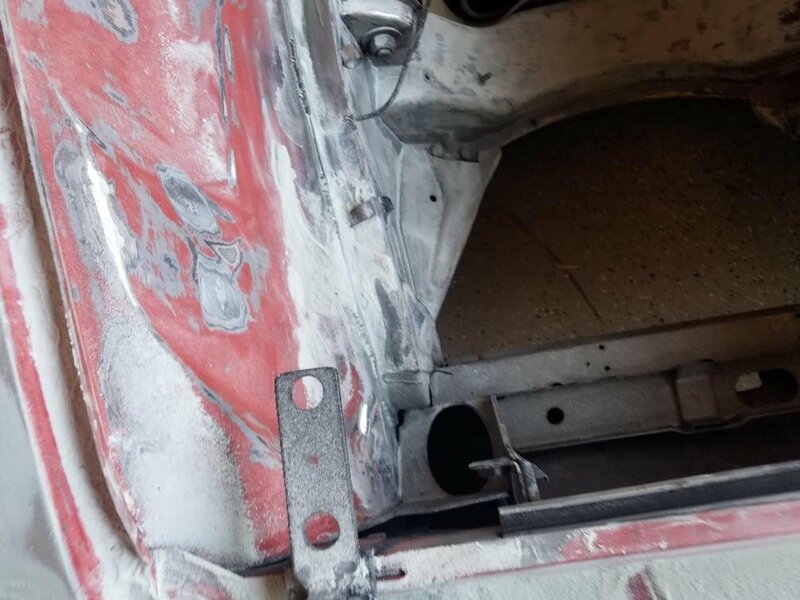 The compartment was a different red than the rest of the car along with some black. 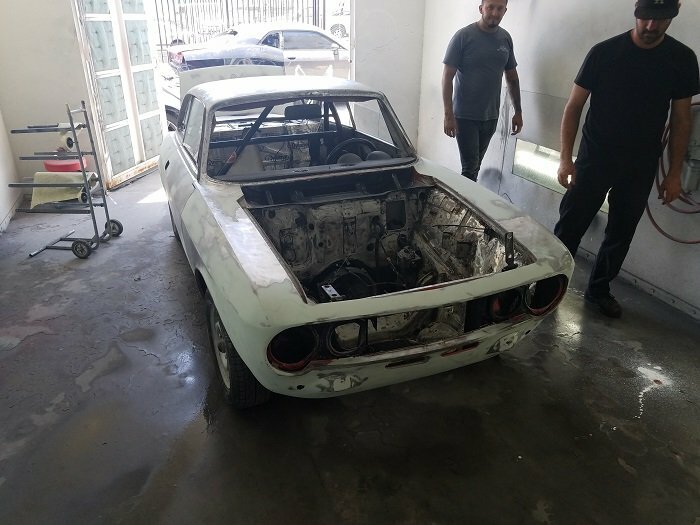 So given that you are now painting the whole exterior, will you still do the engine bay grey? My advice would be to shoot the exterior color everywhere. Yea, that's pretty typical. You learn a lot when the paint comes off. 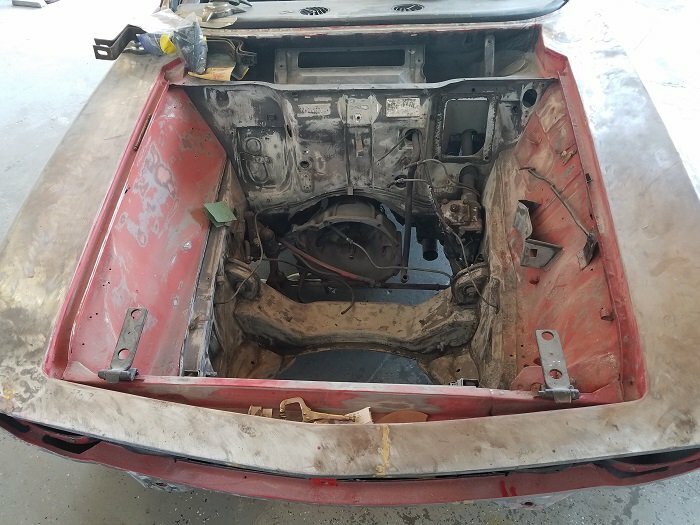 I will paint the engine compartment the same color as the rest of the car. 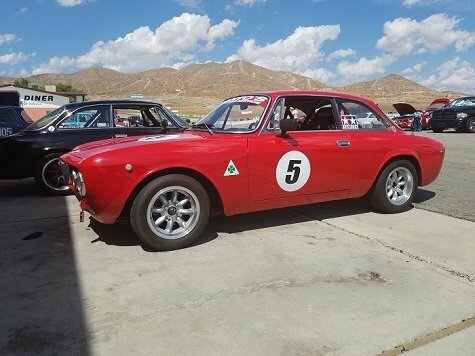 501 Alfa Red has my vote as of now. The nose will probably be the GREEN of the Tag Heuer Logo or something close, applied along the lines of this white treatment. My most recent visit to the shop shows how they are hanging the rear quarter panels to align properly with the doors and the trunk lid. PSk and gprocket like this. Geeze - talk about project creep! FWIWII, AR501 red is definitely the way to go - especially if you're going to paint the nose green. 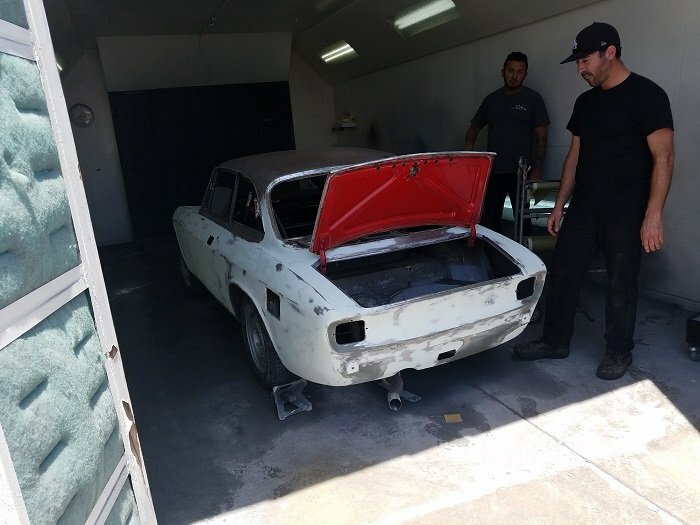 And the car is right on schedule to be done just before the Oct 20-21 Time Trial/Race at Laguna Seca. Well I certainly hope so. Originally there was a target date which we won't hit, but that's not all that surprising when you don't know what you'll find under paint. I hope we are done sometime in July. 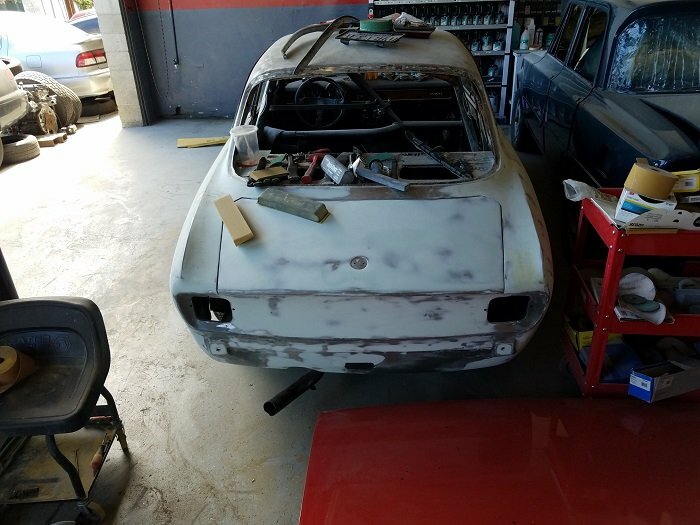 I went back Friday, 2 1/2 weeks after my first post, to check on any progress with my '71 GTV. The engine bay has been cleaned up a lot. We'll be checking in there to see if any seam welding may be needed. 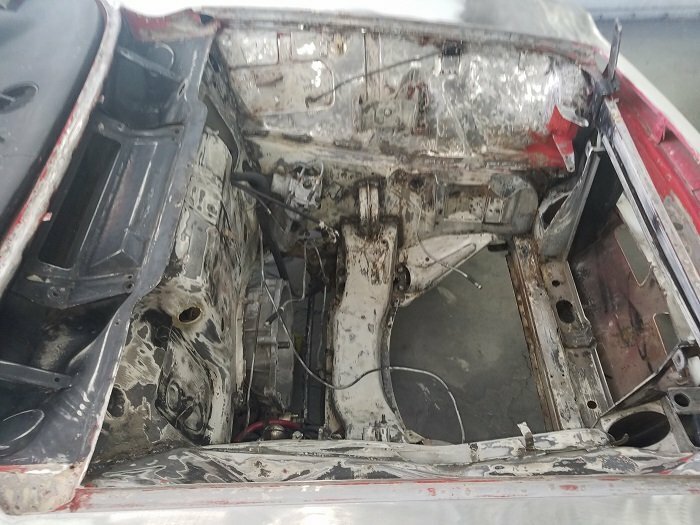 More than that, all the body parts that had been hung and were being positioned and fitted with screws have been welded up. The trunk door, when down, now matches and the spacing all around is even. The fitment on both doors is great. Today I attended the San Marino Car Show and saw a Ferrari in Rosso Chiaro. 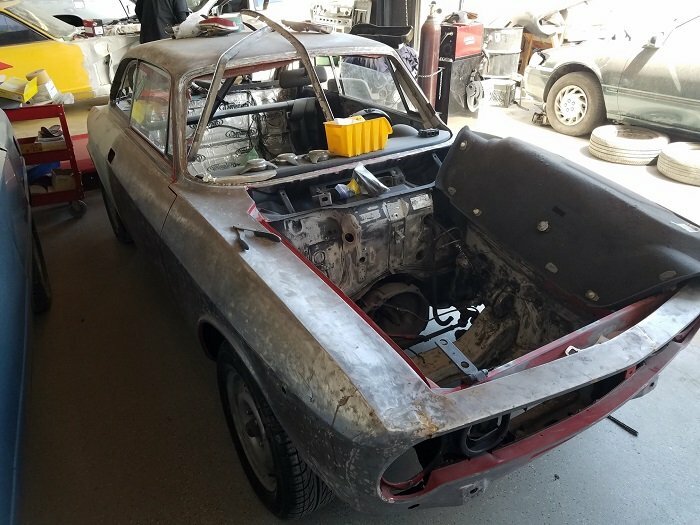 Now I'm debating that color vs Alfa Romeo 501 Red, which I thought I'd settled on. I'd like to see them side by side. That blue car seen in the back of the shop in the last two photos is a really nice Super that's nearly done. You're right Pete. This is a track day car that also will serve as a daily driver. Some of the extra welding you'd do for a race car is being done, but not full on. The car will be a little stiffer. 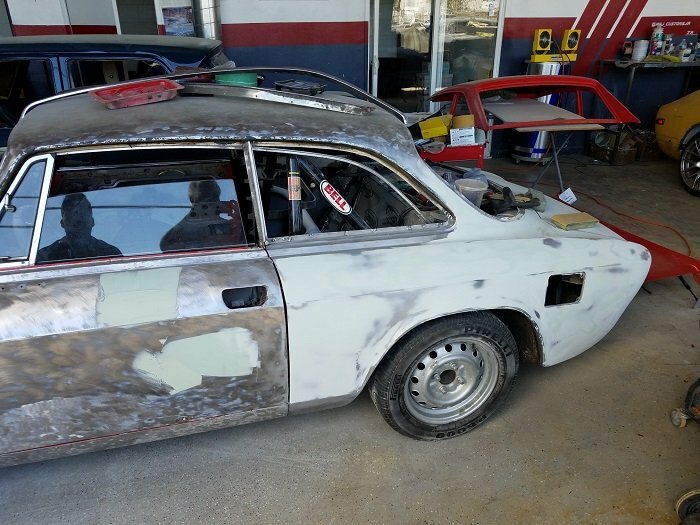 Another weeks progress on the GTV. 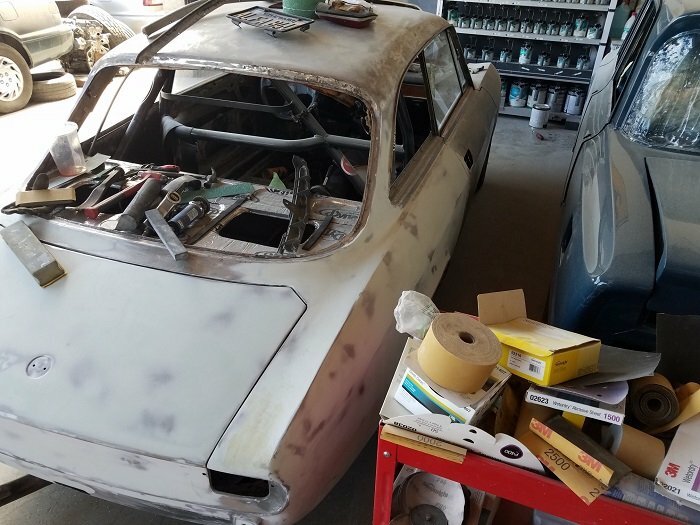 Still the bulk of the work being done on the back 1/2 of the car. If you look at the 2nd pic, I'm thinking of using the back-up light opening as a third brake light. Also, Euro brake lights (with the amber tops) to add some contrast to the red paint. The latest work shows some stitch welding in the engine compartment. Firewall, fenders, x-member. Hard so see because of all the dust. 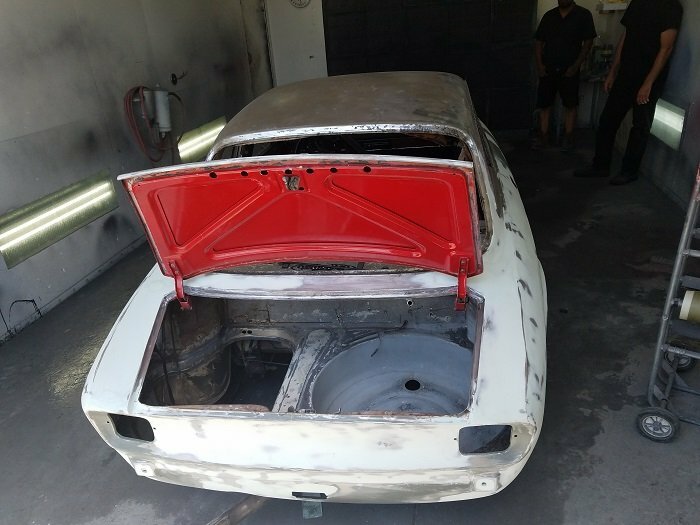 The GTV got rolled into the paint booth in preparation for primer coats. Anthony Rimicci's keeping a close eye on the project for me. He and his father Santo have been very helpful with what I need (and don't need) for a daily driver/ track day car. I'm not going for concours or perfect originality. It looks like I better get serious about finalizing paint colors. Looks so small in those last shots! Yeah, it shrank about 12% after the paint was removed and we washed it . Just kidding...I don't usually notice how small GTVs are until parked next to a Mini (Bimmer version). I've been driving our Camry in the meantime and it seems like a limo.